Trampolines, Teeth and Cuts With a Concussion! I received a Rescue Fan’s email today that described what sounds like an accident on a trampoline. Their friend hit their mouth on their head and now they sound as though they have concussion symptoms with a possible infection on the scalp. They asked my opinion and the following is my reply. It’s warm and it’s trampoline weather so if this happens to you or someone you know, I hope it helps! Ouch! So, it sounds like your friend hit their mouth on your head and though it didn’t knock you out, it made you feel dizzy and now is painful/sore and maybe even a small abrasion or cut? If you’re feelings dizzy, nauseated(sick to your stomach) and have a headache, it sounds like you may have a concussion. As long as the symptoms get better with time from the concussion, you’re probably in pretty good shape. Some people just take tylenol or another over the counter(OTC) pain medication for the headache. With time and rest, it should get better. If not, call your doctor. If you it’s severe or you go unconscious, a family member should call 911. The pain to the touch, redness, or cut and possibility of something coming from the wound may indicate an infection which could be a problem too. If you think it’s something that could be getting infected, it sounds like it may have been a laceration. If so, I’m not sure if needed stitches originally(didn’t sound that way from your story) but it’s probably too late for stitches at this point. Some people like to put triple antibiotic on their cuts and abrasions to control infection. If you’re not comfortable with over the counter or it’s really starting to concern you, it may be a good idea to see your doctor. 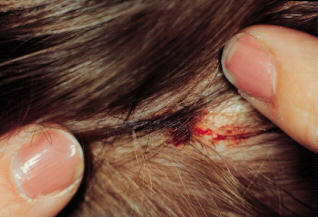 Have your mom take a look at the wound by separating your hair. Is there a laceration where the skin forms a fish mouth? Is it oozing any white, or discolored and blood tinges secretion? If any of these, then it’s probably a good idea to see a doctor. If not, and the wound is closed but red and sore, it’s common for people to get triple antibiotic at a drug store or grocery store, keep the wound clean and then put some of the ointment on the abrasion with a Qtip or cotton swab. Do this until the wound is healed and not painful. Wash your hands before and after all treatment to help not re-infect or infect the wound. Remember, when in doubt, call your doctor and follow their advice. In the meantime, I hope this helps. Tagged Concussion • cut • dizzy • infection • injury • laceration • nausea • oozing • ProCPR • ProFirstAid • red • Roy Shaw • Roy W. Shaw • royonrescue • sore • trampoline • what to do?